The Alzheimer Society of Alberta & Northwest Territories heightens awareness about Alzheimer’s disease and related dementia, provides support services and supports research. The Alzheimer Society of Alberta and Northwest Territories is working to change the face of dementia in Alberta and improve the quality of life for those with the disease. The Society offers a provincial network of educational and support services for those with dementia and their care partners, and advances research into effective treatments and finding a cure for this devastating disease. Until a cure is found, we are here to help. 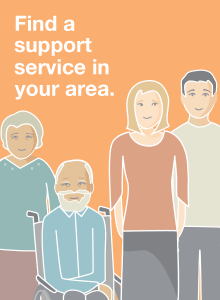 Province-wide peer support groups, telephone and individual support provide practical information and strategies that help people living with dementia and their care partners better understand and cope with dementia symptoms and plan for the future. The Alzheimer Society’s education programs, website and additional resources help people understand Alzheimer’s disease and other dementias, learn strategies to adapt to living with dementia and access community-based resources. First Link is an early intervention service that connects people affected by Alzheimer’s disease and other dementias with services and support as soon as possible after diagnosis. Formal referral from physicians and health professionals allows for proactive contact with individuals and their families. Public policy and the delivery of health care must reflect the reality of people affected by the disease, their families and care partners. The Society champions efforts to ensure that dementia is a health care priority in Alberta. An online gathering place that offers access to information, education and support for people with dementia and their care partners, no matter where they live in Alberta. The development of ASANT Cafe was funded in part by an Innovation Grant from the Alberta government. The Alberta Prion Research Institute and the Alzheimer Society of Alberta and Northwest Territories co-fund the Alberta Alzheimer Research Program. This program allows Alberta-based investigators to obtain funding for Alzheimer’s disease research in areas related to understanding the fundamental mechanisms of the disease and improving the quality of life for those with Alzheimer's. The Alzheimer Society of Alberta and Northwest Territories (ASANT) also contributes to the Alzheimer Society of Canada Research Program. This program provides grants and training awards to Canadian researchers in the field of Alzheimer's disease.